ROSARITO BEACH, Mexico—Completing a glorious three days of thrilling desert racing, USA’s Colton Udall rode solo to capture the overall motorcycle victory Sunday to conclude the internationally-televised Rosarito Beach 20th SCORE Desert Challenge in Rosarito Beach, Mexico. Enjoying the first SCORE race in history in Rosarito Beach and the first time in the 40-plus year history of the world’s foremost desert racing organization that motorcycles and quads had their own day to enjoy the SCORE spotlight, Ox Motorsports’ Colton Udall, Yucca Valley, Calif., rode solo on his No. 1x Honda CRF450X to cover the 128.4 total miles in a total winning time for four laps in three hours, two minutes and 44 seconds with an average speed of 42.16 miles per hour. With a special race format, Round 3 of the four-race 2016 SCORE World Desert Championship was held through Sunday in Mexico’s Baja California. The race was run in split sessions with racers covering two laps of a rugged 32.1-mile loop course in each session for 128.4 miles total. It started and finished just south of Rosarito Beach in the Los Manantiales area south of central Rosarito. The car and truck classes ran the first half of their race on Friday and their final two laps on Saturday while the motorcycles and quads ran both of their sessions on Sunday with a break between each of the two-lap sessions. On Saturday Mexico’s veteran Juan C. Lopez captured the overall and SCORE Trophy Truck division victory in 2:57:32 as the event had 127 starters and 79 finishers for a 62.21 percent finishing rate. For Udall, who races the longer-distance SCORE races with teammate Mark Samuels, also of Yucca Valley, ran another flawless race to help his team remain undefeated after three races in the 2016 SCORE World Desert Championship. Udall rode the first two laps in 1:29:56 during the morning session and handled the final two laps following a race break of a little over one hour in 1:32:48 during the afternoon session. Starting first in the morning session with a near dust-free ride, Udall started in the back of seven starters in his Pro Moto Unlimited class and the dusty conditions slowed him down for a slower second-half split. Udall managed a victory margin of nearly eight minutes over runner-up Shane Esposito, Lake Elsinore, Calif. (Rider of Record-Francisco Arredondo) who had a time of 3:10:32 on the No. 45x Honda CRF450X. Following the leaders to the finish line, besides Udall and Esposito, the other riders who earned times in the top five overall motorcycle finishers were: third overall was was Max Eddy, Barstow, Calif. in a time of 3:12:40 on the No. 46x Honda CRF450X, fourth overall was Larry Serna, Chula Vista, Calif. in a time of 3:13:00 on a KTM XCW450 and fifth overall motorcycle was Trey Vansourt, Valencia, Calif./Jeremy Newton, on the No. 47x Honda CRF450X in an elapsed time of 3:13:48. Javier Robles Jr of Guadalupe Victoria, Mexico rode solo to victory as the fastest overall Quad in the race. Staying undefeated in three races in the 2016 SCORE World Desert Championship, Robles seized the day by riding his Honda TRX450R to a winning time in the Pro Quad class of 3:09:23 with an average speed of 40.68 mph. The other class winners Sunday in the motorcycle classes were Colie Potter, Las Vegas (Class 40, Honda CRF450X), Emanuel Verdugo, Ensenada, Mexico (Rider of Record-Fernando Beltran, Ensenada, Mexico (Pro Moto LimitedChristopher Schultz, Kamuela, Hawaii (Class 30, Yamaha YZ450X), Mark Winkelman, Cedar Hill, Texas (Class 50, Honda CRF450X) and Michael Skurkis, Henderson, Nev. (Pro Moto Ironman, KTM 450XCW). Unique for SCORE, the 20th time used this race format that saw all classes racing a total of four laps over a surprisingly rugged 32.1-mile race course (128.4 total miles) split into two, two-lap sessions. The race features a colorful course, finalized by SCORE CEO/President Roger Norman along with Race Director Jose A. Grijalva of 32.1 miles through the foothills and around a mountain to the south and east of central Rosarito Beach. It started and finished at the Los Manantiales area. This landmark race course was another memorable example of Baja California diversity in terrain starting near sea-level and climbing up twice to around 2,000 feet. The course was another unique jewel reflecting the majestic beauty of Baja California going through more ranches than most SCORE race courses. Traveling in a clockwise direction, the race course weaved its way through washes, on existing trails, up and over a ridgeline trail at the top of two hills and back down into the start/finish line. The race course included three physical, full-stop checkpoints, checkpoint No. 1 at race-mile 9.4, CP No. 2 at race-mile 18.6 and CP No. 3 at race-mile 26.7. While this was the first time in Rosarito, the SCORE Desert Challenge has been held 19 previous times since it first began in 1995. It was held in Laughlin, Nev., USA, from 1995 through 2012 and in Plaster City, Calif., USA, in 2014. COLTON UDALL, No. 1x (First overall motorcycle and first in class. Quotes following the first heat.) — I lapped three people which I was surprised by. I expected to lap more but I’m glad that it didn’t happen. I was actually equipped with a horn so I could try and get guys out of the way. The course is much worse than during pre-running because huge horsepower trucks and buggies have been racing on the course. The stuff where it is hard pack isn’t a problem but there are some nasty square edges where if you’re not careful you can crash pretty hard. All the stuff in the back where it is already broken down and soft is now really soft. There are big silt ruts and super gnarly rocks. The bike is constantly working and being abused by the rocks. It isn’t easy and a lot of guys underestimate the difficulty. They think I’m a cheater when it comes to racing the long miles. I just hammered that run and it comes down to knowing where you’re going and what you are comfortable with on the bike. I’m one with that motorcycle and I’ve been racing it for eight years now so it’s like we gel quite well. People doubt, but I think this short course will prove that I’m not taking some crazy line. I’m out there hammering the throttle and making sure I don’t crash. (Udall Quotes following the second heat.) I just rode the race course and tried to pass as many guys as I could. I crashed twice throughout the day. Everything is difficult on this race course. 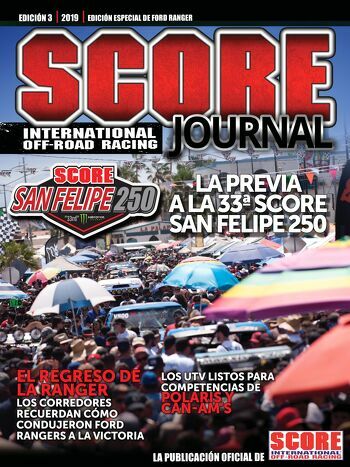 We will start prepping and getting our pits ready for the SCORE Baja 1000. The plan is to Ironman the Baja 1000 and Mark (Samuels) will be my backup if I have any issues. It has been a goal of mine since I started racing in Baja and I’ve won four championships with my teammates on two different teams. I want to Ironman because it is a goal of mine and I feel like it’s my time. LARRY SERNA, No. 15x (Fourth in class.) — I would have been more confident in myself if I had more time to pre-run the course. We all get used to the track and just go with the rhythm and stay safe and go fast. CHRISTOPHER SCHULTZ, No. 301x (First in class. Schultz shared riding duties with Ryan Leibelt.) — We knew we had a 30-minute gap (going into the second heat) so we knew that all we had to do was finish. That was our goal. Everything went great except that I fell coming out of the start on the second lap. It was no big deal because I got right up and the bike was still running so we got lucky. COLIE POTTER, No. 400x (First in class. Potter shared riding duties with Dave Glass.) — Co-RIDER DAVE GLASS said: The rocks kind of sneak up on you and I jumped into a silt bed and it went over me like a tidal wave. On the first lap I did a turnabout when my bike hit something and I ended up facing the other way. I got up from that and continued on. Those rocks are round rocks and they just roll you. MICHAEL SKURKIS, No. 729x (First in class.) — I ran out of gas in the first heat so I was stuck up on a ridge for 20 minutes. I borrowed a gallon and a half from a pre-runner truck. He took his gas tank apart to get me gas and let me finish the heat. My mousse came apart in the first lap of the second heat. I felt it slipping and sliding so I had to nurse the bike and dodge all the big stuff to keep the front wheel from coming apart on me. GARRETT POUCHER, No. 106x (Second in class. Poucher shared riding duties with Michel Valenzuela.) — We won the SCORE San Felipe 250, had bad luck in the SCORE Baja 500 with vapor lock issues so we came out here today to run a clean race and try to get a finish. This morning was looking a little rough and nobody really wanted to race but we went out and the course ended up being a lot of fun. It was very technical and very difficult but we enjoyed it. JAVIER ROBLES, JR. No. 1a (First overall quad and first in class.) It was a little dangerous out there because of all the rocks and because of the cars and trucks having run the course for two days. I was surprised that I had the lead after the first heat so I rode hard on the second heat and hopefully it was enough.